A fresh-looking occasional table is an excellent addition to any living room. The added style and convenience is the perfect matching table which makes a must-have for every home's decor. It creates the perfect space for home accents such as family portraits, candles or table lamps. 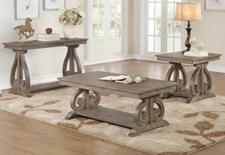 A new coffee table becomes a gathering space for guests, plus end tables add warmth to your living room or den. Browse our selection of occasional tables to find just the right table or set for your home decor. We have tables with wood bases and glass tops to marble tops, wood and metal bases with glass top. 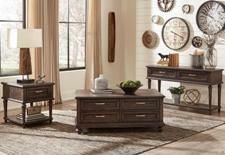 Choose from styles like traditional, transitional, country, contemporary and more, at the lowest prices anywhere!